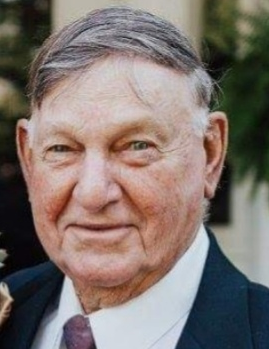 Robert Rudolph “Bud” Wyler, 88, of Stanford, KY passed away Saturday, March 16, 2019 at home. Born December 9, 1930 in Stanford, KY to the late Christian and Matilda Laudemann Wyler, and he was the widower of the late Anne Hackley Wyler. He was a United States Navy Veteran and a lifelong farmer, earning “farmer of the year” in 2015. He served on the Lincoln County Dairy Committee, the Southern States Advisory Board, was a member of Farm Bureau, and a member of Hebron Lakeside Church. Survivors include three sons, Paul Edward Wyler (Susan) of Lancaster, KY, David Bruce Wyler (Megan Welch) of Mount Washington, KY, and Norman Chris Wyler (Colleen) of Kingsport, TN; two sisters, Carolyn Helton of Fort Wright, KY, and Rosa Lee Carrier of Waynesburg, KY; three grandchildren, Laura Beth Livers, Deborah Ann Whitsell, and Christian Matthew Wyler; five great-grandchildren; and several nieces and nephews. In addition to his parents and wife, he was preceded in death by two brothers, Albert Wyler, and Fred Wyler; and three sisters, Margaret Alford, Ida Mae Gover, and Elizabeth Cooper. Visitation will be Monday, March 18, 2019 from 6-9pm at Spurlin Funeral Home Chapel, Stanford. Funeral service will be 11am Tuesday, March 19, 2019 at the funeral home with Reverend Robert Camenisch officiating. Burial will follow at Danville Memorial Gardens. Casket bearers will be: David Horn, Hunter Horn, Kenneth Gooch, Christian Wyler, Earl Cooper, and Jimmy Alford. Honorary bearers are: Larry Brown, Barry Spurlin, Stan Carnes, Gary Wayne Gander, Fred "Bo" Gander, and Boyd Gilliam. Memorials in lieu of flowers may be given to Hebron Lakeside Church (27 Boone Road Cutoff, Stanford, KY 40484).